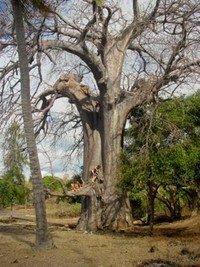 Even a short stay on Mayotte island left me with a stunning memory of the omnipresent baobab trees of the Southern part. They are called 'Mbuyu' in the local tongue of Shimaore and in English, they are known as the lemonade tree or monkey-bread tree. I previously wrote about my visit to Mayotte Island. While there, I saw many Baobab trees. The Bombacaceae family (now included in the Malvaceae family) has about twenty-five different genera. 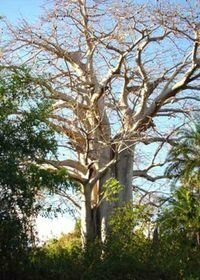 The Adansonia genus (named for Michel Adanson, a French botanist who lived during the 18th century and worked on African flora) has eight species. Six of them are endemic to Madagascar, one is from Australia and one from Africa; it is the one we will discuss in this article. 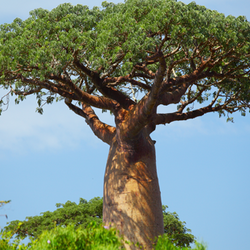 Adansonia digitata is the most widely known of all species of baobab as it has the largest natural area. It originates from the sub-Saharan dry parts of Africa but nowadays is found all over the tropical and sub-tropical parts of the continent, always in dry places as it does not stand humidity. 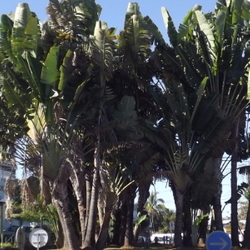 Its weird and lumpish outline can be seen from Senegal to northern South Africa (Limpopo province), in Madagascar (where it was brought and has naturalized) , the Comoros (which include Mayotte) and more rarely on Reunion Island--but those will not be older than a century or so, a very young age for trees which can live up to 2000 years. This tree can reach 25 to 30 m (75 to 90 feet) high and a diameter of 3 to 6 m (9 to 18 feet) or even larger. An outstanding specimen is the ‘Big Tree' of Tshipise in South Africa, which has a stem diameter of 10 m (30 feet); you really have to see it to believe it and I was fortunate enough to meet up with this amazing tree. The trunk of A. digitata is sometimes hollow, either naturally or because it was dug by people for shelter, it often hosts wild bees (Apis mellifera) in Africa. This trunk is reminiscent of an elephant, not only because of its vast size, but also because of its grey colour and the numerous bends and folds it develops. The smooth bark is used to make strong ropes, baskets, nets and even cloth, which explains the numerous scars seen on many individual trees. The good news is that this species has the ability to produce new bark and will therefore not suffer too much from the bark harvesting. The leaves are compound or digitate (hence the species name digitata), bearing five to seven leaflets and are deciduous (i.e., they fall during the dry season.) Known as ‘lalo' in several parts of Africa they are eaten and much appreciated because of the high content of iron and calcium, two precious elements in countries where malnutrition is a common thing. Young shoots and roots are also eaten, much like asparagus. 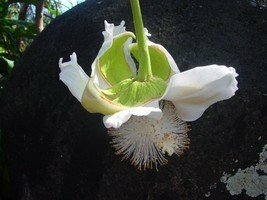 The pendulous flowers (they are erect in Malagasy species) are quite large with white reflexed petals and numerous long filaments ending by the stamens. They open at night and are pollinated by bats (a trait known as chiropterophily) and on Mayotte this job is done by the endemic flying fox Pteropus seychellensis comorensis. 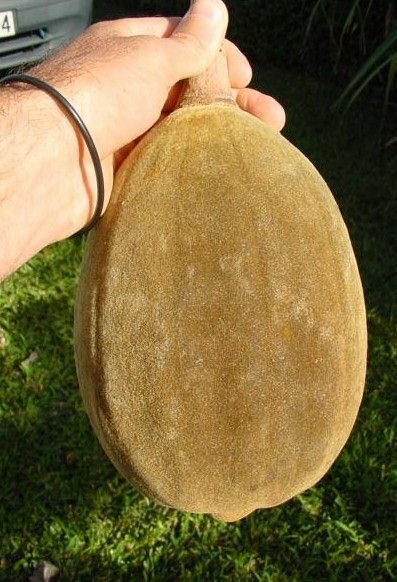 Those flowers will give birth to large, pendulous fruits either spherical or elongated, about 20 to 30 cm (1 foot) long and 15 cm in diameter, with a hard woody shell either brown or greyish covered by a thin down. Once the shell broken (which will require some work) you will find a white, dry pulp surrounding the numerous seeds (the name baobab actually comes from the Arab ‘bu hibab' which means many seeds.) This pulp is edible; it has an acid flavour and a high percentage of vitamins C and B1, it can be eaten out of hand or diluted in water to make a refreshing drink. The hard seeds are about the size of a coffee bean and are rich in oil and proteins (respectively 15% and 48%). This plant can be successfully as an indoor potted plant. 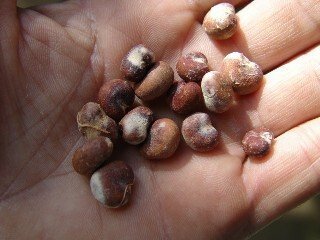 If you wish to try growing it from seed, you will have to treat the seeds with boiling water. 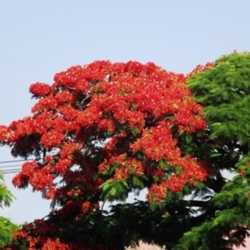 Indeed, as the tree originates from savannah areas where fires are a common hazard they have developed an inner mechanism to allow seeds to sprout after bushfire, just like the flame tree (Delonix regia) so this thermal dormancy will be triggered by covering the seeds with simmering water and letting them soak overnight. The growth is quite slow and the tree will enjoy a rather loose and well drained soil, even sandy like the beaches of Mayotte where it does pretty well. As a young plant the trunk stays rather thin and leaves are entire, they become compound only with age. In Africa, this is a revered tree and it has an important place in stories, social life and--as described above--as food. Close relatives are the Bombax and Ceiba trees, known as kapok or silk-trees and the famous (but controversial) durian fruit (Durio zibenthinus) of southeastern Asia.